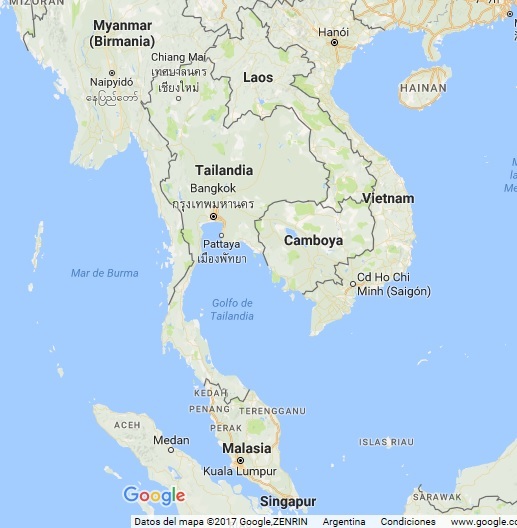 Thailand is located in the Southeast of Asia. This country had been named Siam until 1939 when its name changed to Prathet Thai (Prathet means country and Thai means freedom and, in addition, that is the name of the biggest ethnic group in Thailand). Finally, in 1949 the name was changed to Thailand. Currently the country is a constitutional monarchy, ruled by the Chakri dynasty. The new king reigns since 2016 when his predecessor died. The king of Thailand has the title of head of state, head of the armed forces, adherent Buddhist and support of religions. 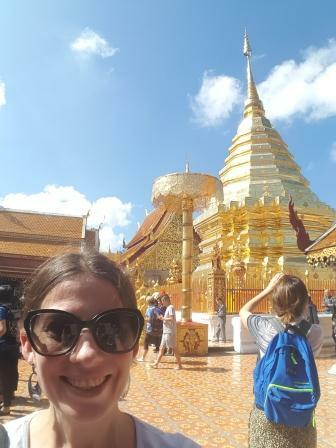 The last time I was in Thailand, it was in November 2016 and I had the opportunity to participate in ceremonies performed to the king who had passed away. 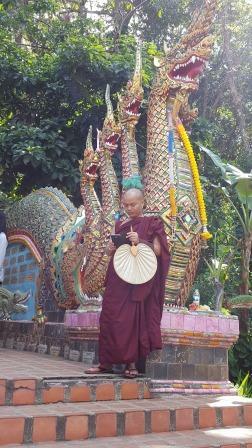 The official language of the country is Thai and the main religion is Buddhism, practiced by 95% of its population. 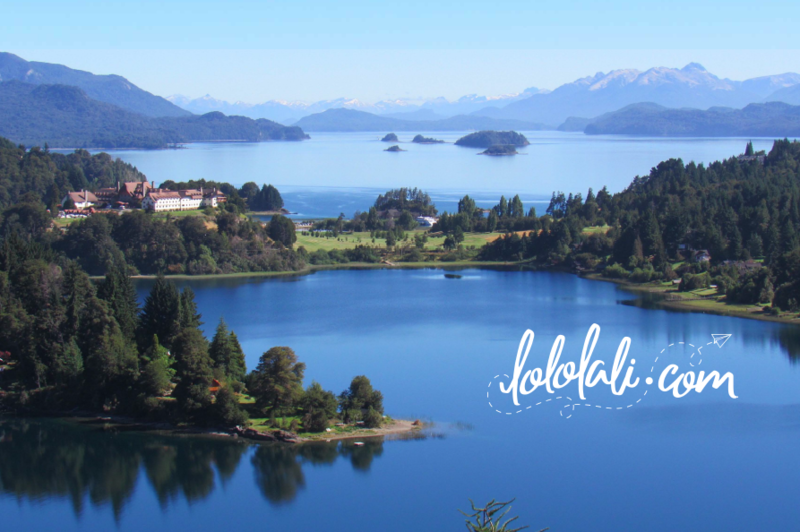 In my different visits I have been lucky to travel from the North to the South, and despite the fact that I’ve been there before, I continued to be surprised by the beauty of the landscapes and the people. I was fortunate to travel with some girl friends, and Lolo with her 11-year-old daughter, so I can assure you that it is safe for women traveling alone. Thailand has a huge variety of activities to do and places to visit, so I find it very difficult to condense it in a few lines. Below you will find the places that you should not miss, if you go to Thailand.. This wonderful city has endless places and things to discover. Next, I’ll give you some top things I discovered in this incredible city. The traffic is usually quite chaotic, so it is advisable (not only for the traffic, but for the experience itself) to take what they call tuc-tuc. A strong recommendation, please, arrange a price beforehand to the place of destination and confirm with the driver that amount of money is for the totality of passengers, to avoid misunderstandings, and getting overcharged. 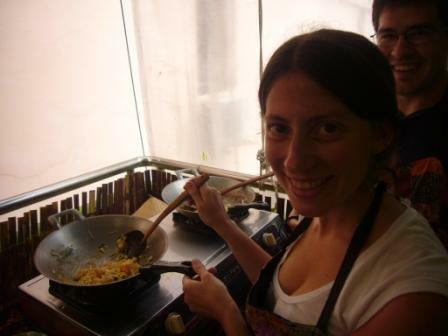 Something you must do is a cooking course in Bangkok. Thai food is really famous worldwide for its exquisite mix of flavors, so it is highly recommended to take half a day to go to the typical markets and learn how to prepare the local food, such as Pad Thai. I remember that I booked the cooking course on the internet several months before going, and agreed at that time that I was going to be picked up by a woman at a subway station. I honestly thought it was kind of weird, but to my surprise, as I was standing there, the woman with large eyeglasses as she described herself to me in the confirmation email was coming to pick me up to take me to the school.. The school I went to is named Silom Thai Cooking School (at the end of this article I ‘ll detail the data in case you are interested) and both the attention, the chef and the facilities were excellent. That course included a visit to a local market along with the school chef. Wat in Thai means Temple. Wat Phra Kaew (where the Grand Palace is located), neighboring Wat Pho and Wat Arun are three must-visit temples that you can do on the same day, taking the boat that crosses the Chao Phraya River. 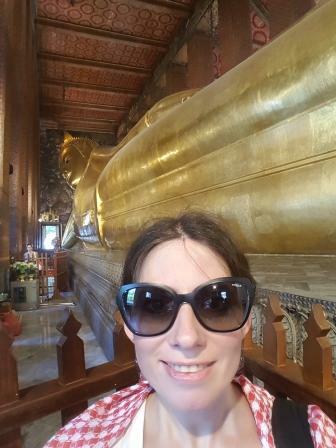 In my experience, the 2 times I wanted to go to the Wat Phra Kaew temple, which is where the Emerald Buddha Temple is, someone with a tourist guide card or a police officer told me it was closed and they recommended me to go to another place. Luckily I was advised by other friends of mine, to just go and it was opened every time. So, check temple’s timetable before going and don’t trust info just from anybody. In Wat Phra Kaew you will find the Grand Palace, and a site with different temples, there is even an amazing Angkor Wat mock up. Touring this temple takes more than a couple of hours. To enter the temples, women should cover their shoulders and wear long skirts or wide pants (shorts are not accepted), men should also dress appropriately. If you do not have the right clothes, you can rent one at the entrance. The money will be refunded to you when you return the garments (you must have local currency since they do not accept other currencies, nor credit cards). The Grand Palace was originally the royal residence. 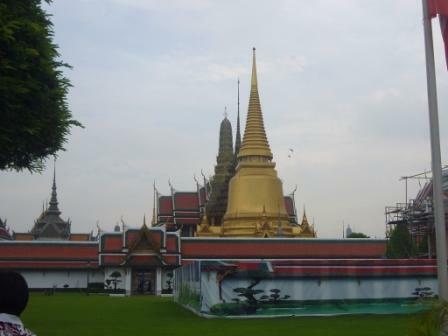 Nowadays, the Grand Palace is used only for ceremonies such as the Day of Coronation. Wat Pho is Bangkok’s oldest and largest temple, home to the largest Buddha in the country and the largest number of Buddha images. 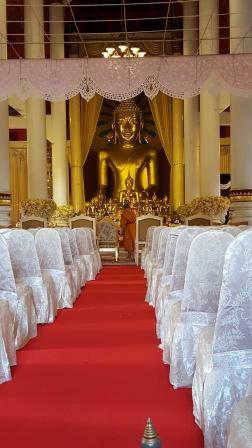 The best known is the lying Buddha, 46 m long and 15 m high representing the passage of Buddha to nirvana. I recommend you spend a whole day visiting all three of them, since sometimes you have to stay in line to access them. 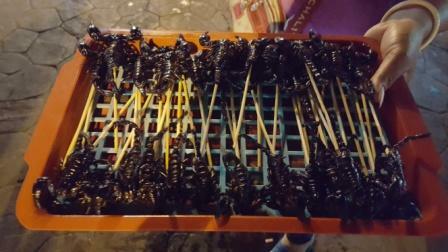 The mix of stalls selling a variety of goods and exotic foods (such as ready-to-eat insects that do not allow easy photographing) and not so exotic, is incredible. One recommendation is to eat the Pad Thai (Thai dish containing rice noodles, with chicken, vegetarian or seafood, egg, dried fruit, fish sauce, etc.) in any of the stalls. Besides the street stalls, there are a variety of restaurants of all types and costs. It is a touristic area so there is plenty of police to ensure that tourists do not have any unfortunate inconveniences. In spite of this, I recommend you not to neglect your belongings. You cannot leave Thailand without a Thai massage! When you walk down the street you will hear “Thai massage, 150 baht” (or the price at the moment). In places like Chiang Mai Thai Massages are cheaper than in Koh Phi Phi or in Bangkok. A must-do is to travel by boat on the Chao Phraya River. You can do it with the community boat or in special boats, and until dinner time in some of them. The community or public boat has round trips during the day. If you are staying far from the area of ​​the temples and Rambuttri, I recommend you to check the schedules carefully to ensure a place in the boat. 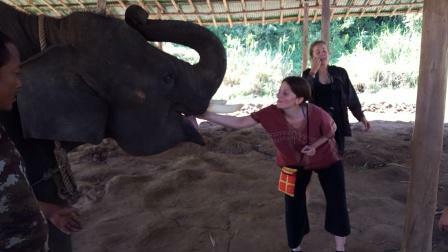 Chiang Mai, the capital of the homonymous province, is the largest and significantly cultural city in northern Thailand. 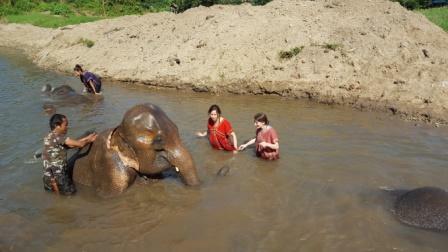 It is located about 700 km north of Bangkok which translates to 10 hours by bus or around 2 hours by plane. In recent years, Chiang Mai has become an increasingly modern city. It has countless places to visit and activities to do. The historical significance of Chiang Mai corresponds to its important strategic location in an old commercial route. This beautiful city has a street market that spans several blocks, where, as in Rambuttri you can get all kinds of goods. A typical dish that you can try here is the Khao Soi (Thai dish with Burmese influence. It is a noodle soup). 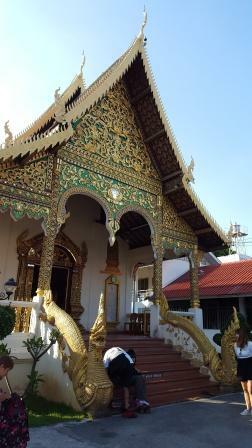 One of the most amazing temples is the Wat Phra Doi Suthep. 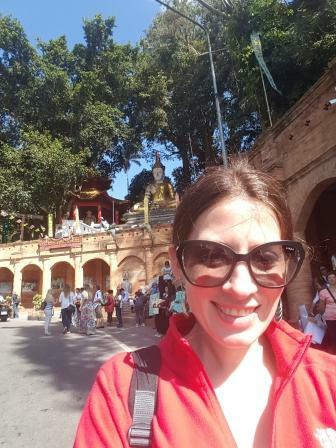 You have to take a tuc-tuc or a taxi to go there, because the Wat Phra Doi Suthep or simply Doi Suthep which is located 15 km from Chiang Mai. It was founded in the late 14th century. 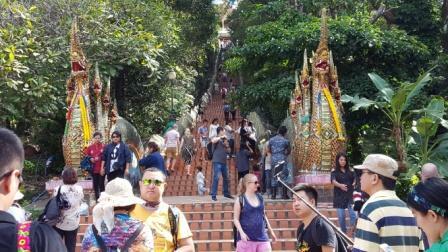 To get to the pagodas, you have to climb the stairs you can see in this photo (309 steps). Within Chiang Mai, which has a large variety and number of temples, one of the most important there is the Wat Phra Singh. 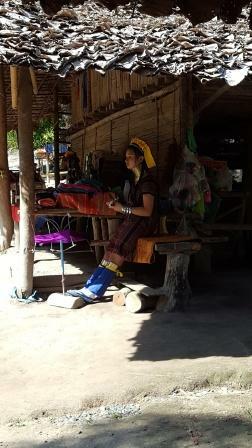 On the outskirts of the city of Chiang Mai, you can find the giraffe women tribe. If you decide to go there, it is completely prepared for tourists. There you can see women knitting or making their handicrafts, and you can take some photos with them, as well as women of other tribes. If your idea is to buy handcrafts or typical Thai products, I recommend to buy them in Chiang Mai city because it is the most economic one. Near the giraffe women tour, you can go to one of the elephant reserves, where you can feed , bathe elephants and spend time with them. If you like the idea of ​​being close to an elephant, I recommend you to do it in this area, and not so much in the south, because, according to my experience, in the south (Phuket area) I saw handlers mistreating elephants. Staying with the elephants in that reserve is an incredible experience, and if you don´t have much time, you can visit the tribe of giraffe women, and the elephant reserve on the same day. 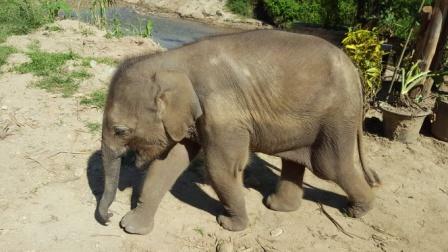 When I went to this reserve there were a couple of elephants rescued from circuses. Despite the fact that they were in the reserve at that moment, they still maintained behaviors acquired when they were under stress such as the wobble left and right. If you enjoy nature and animals this is a must see. 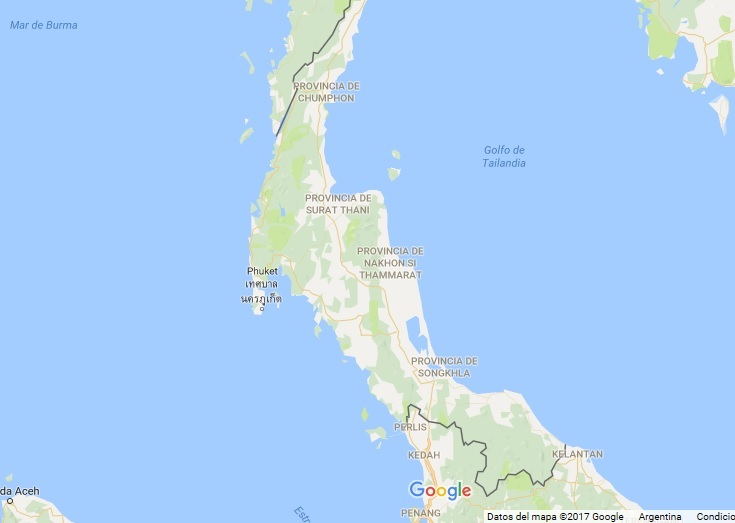 If you plan to go to the famous Thai beaches, one of the places that I recommend is the southern area in the archipelago that is in the Andaman Sea. The Phi Phi Islands (also known as Koh Phi Phi or Phi Phi Don) is a small archipelago which is located in the Andaman Sea in southern Thailand. This archipelago has become very popular for tourism in recent years. 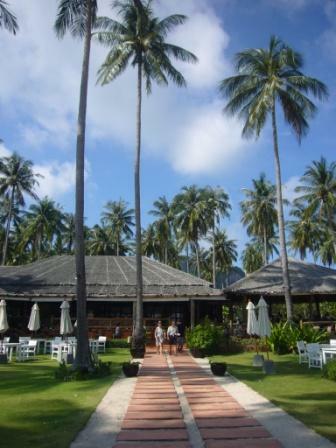 The facilities on the island are prepared for young people who go with their friends to enjoy the beaches and discover the Thai night (there are several discos that overlook the beach and others inside the village itself). Also it is prepared to go as a couple or with friends and just enjoy it in a more relax way. 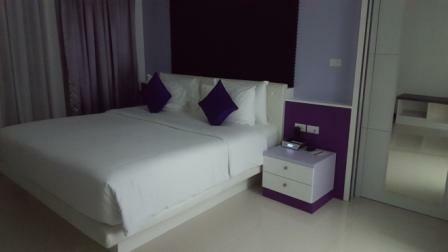 For this type of trip, it is more advisable the complex of hotels that is more distant to the center of the town. I went there as a couple, and Lolo went there with her 11-year-old daughter and had a great time. When I was there for the first time, I stayed in one of the most remote hotels in the center, to get there, you have to take a boat around the island. I remember that to return to the hotel at night from the town, I had to turn on my flashlight or my cell phone so that the rest of the boats knew where we were coming. 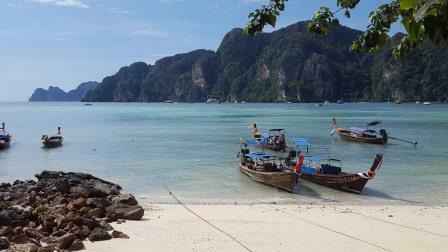 If you like snorkeling or diving, Ko Phi Phi is an excellent place to do it. In particular the night dive was amazing. It seemed like I was in the middle of a starry night under the sea. It was a best night dive in my almost 10 years of active diving. 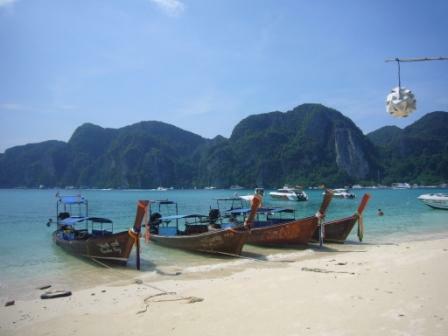 Koh Phi Phi has a great offer of diving shops and other type of excursions. The waters are so calm that in many places they look like pools. Lolo just snorkel in the area and it was just as fun! I also went kayaking on various beaches, and I could spend a long time enjoying the scenery without paddling. An evening attraction that you can go to in Koh Phi Phi is the ring fights, where tourists can participate, both women and men. Bets by means of awards that are measured in bottles of alcohol. 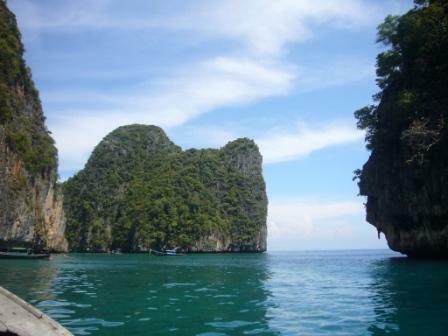 The archipelago is composed by four main islands, Koh Phi Phi Leh, Ko Young, Koh Pai (Bamboo Island) and Koh Phi Phi. 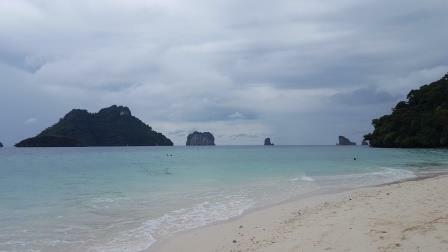 Koh Phi Phi Leh (also spelled as Phi Phi Lee) is the smallest among the two main islands. It is an island formed by limestone cliffs that emerge hundreds of meters from the sea. This island has two beaches, within which, the best known, beautiful and extensive is the Maya bay, whose name is due to a legend about a woman of the same name who found the end of her days in that place. In order to enter the beaches, an entry fee must be paid. On this island several movies were filmed, like “The Beach”, which caused some problems because it temporarily modified the island in 1999. At the end of filming, and after a second attempt, the bay again looked the same and recovered completely. It is not as pristine as it was before, some garbage around the beach and in the ocean. Very disappointing! 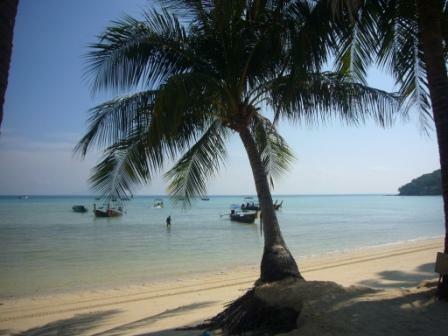 In 2004 the island became part of the Phi Phi Islands National Park and the island was equipped for tourists. 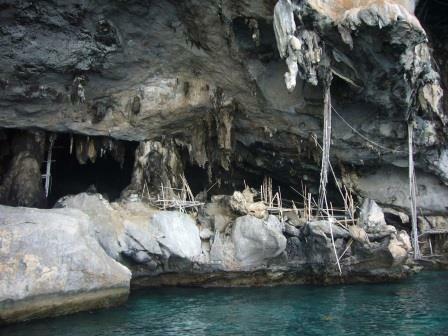 In that way the fishermen that lived there had to go to some caves that are on the other side of the island. 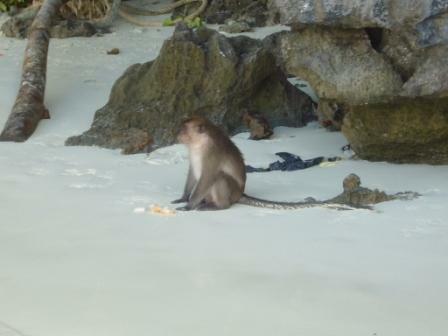 You can also go to Monkey Beach where you can hang out and interact with monkeys. 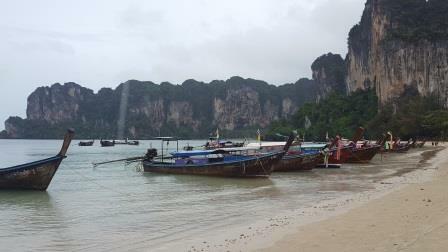 Excursions to Monkey Beach and Maya Bay can be done through hiring a tour between 4 and 7 hs or paying a local boat. In that case you can stay without any limit of time. 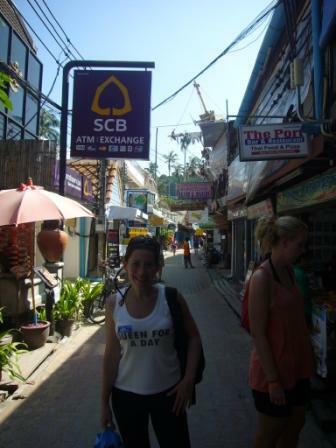 While in the Koh Phi Phi area I recommend that you eat a lot of sea food, which is excellent! 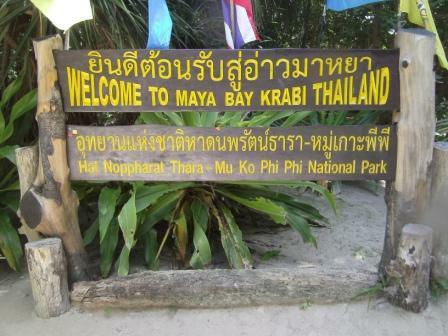 Koh Phi Phi can be reached by ferry from both Phuket and Krabi. From my point of view (I have been in both places) and the people who have traveled, Phuket is perfect if you want to go out dancing at night, and not so much to enjoy the beaches and day life. Just the opposite thing happens with Krabi. Both places are prepared for the visit of tourists. If you are going with your family, as a couple or with friends who like to enjoy the day and not so much the night, I recommend you go to Phi Phi through Krabi and stay a couple of days in Ao Nang before taking the ferry. 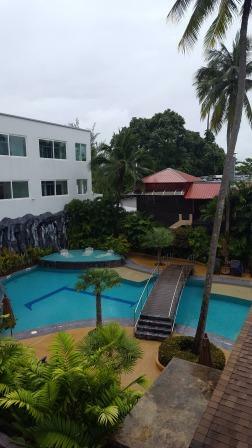 If you go to Phuket, the main tourist region is Patong Beach, which also concentrates most of Phuket’s nightlife. If you are staying in Krabi, I suggest to go to Ao Nang, from there you can get many excursions to different beaches such as Poda Island. To communicate with the locals, be very direct to speak, in general terms, people who are in the tourism environment do not have a very good level of English, and sometimes it is difficult to understand if one speaks with idioms or very complex terms. Check timetables in advance to visit temples of Wat Phra Kaew and Wat Arun. Do not trust what others say. If you are going to tour islands from Ao Nang, as I told you before, you can pay for a tour or a community boat or a private boat (it is the same as the community but closed to the group that hires it). If you do not want to spend a lot of money, when you get to buy the tickets, wait for a while, other tourists will surely come, wanting to visit the same beaches as you, and you can join them in the community boat, making the trip cheaper. In general terms, you have to pay an admission fee to all islands. It is always in cash and in local currency, as well as the payment of the excursions, so I recommend having cash available at all times. Luckily, for tourists, there are many currency exchange offices and ATMs to get cash in tourist areas. 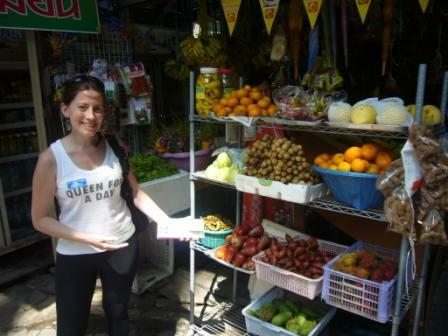 Haggling is part of Thai culture, so when you want to buy something in a market, do not forget to do it. 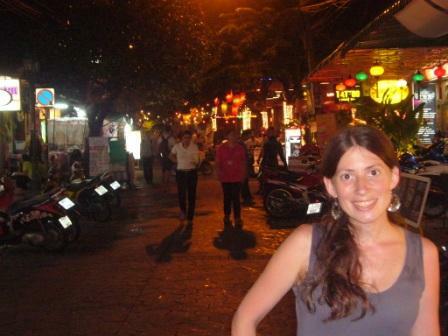 There are no problems for women traveling alone. An example is Lolo who traveled with her 11-year-old daughter and had no problem whatsoever and I traveled with 4 other girl friends. 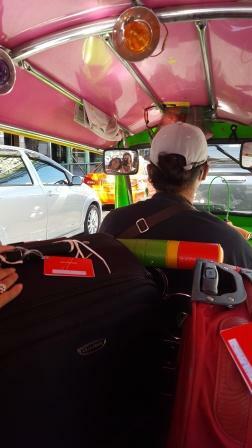 If you take a taxi in Phuket to go from the airport to your hotel, there is a recommended one at the airport. But, they have the habit of stopping at some point and a man jumps in the taxi. A very scary situation, if you don´t know this. They do this to sell you tours and hotels, in a very aggressive way. If this happens to you, just stay calm, and say “Not interested, thank you”. Temples should be visited with the required dress code (covered shoulders and legs covered to the ankle), and remove shoes and hat or cap (when you take off the hat do not put it on the shoes, put it next to them). Wear comfortable shoes, easy to take off and put on. The temples are clean so you do not need to wear socks or some foot covers. It is rude to point with your foot. In temples like Emerald Buddha there is a sign indicative of this. For the Thai, the feet is the lowest status. Fix taxi price before you get in, and confirm that they are for all travelers to avoid problems later. Taxi or tuc tucs usually arrange a fixed-price for the trip, so if there is a lot of traffic and they take too long they can get a little anxious and in some cases, I have come to hear that they have asked people to get off. 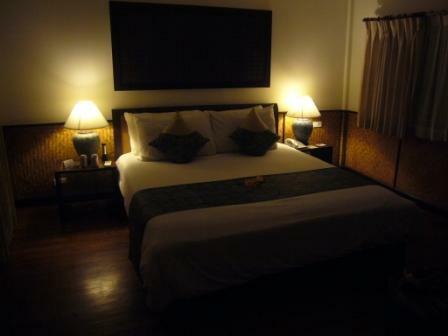 Massage is cheaper in Chiang Mai and shopping is convenient in Chiang Mai because it is cheaper. The food is very spicy. If you are interested in trying spicy food, I recommend that you ask for a white rice dish, as the rice calms the effects of the spicy feeling. Be careful if you do not like spices, and find out previously how the food is prepared. 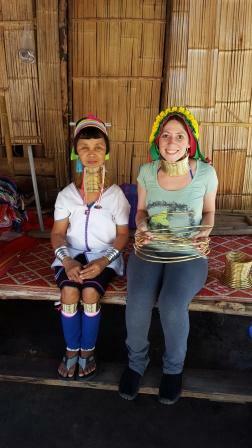 If you make the tour of giraffe women, there are different tribes, and they sell handicrafts, which you find almost the same in Chiang Mai at a lower price. From Bangkok airport there is a train that takes you to the city. From there you can connect with a tuk tuk or the skytrain. It is not necessary to take a taxi or a private car. If you take a taxi ask to be metered to avoid getting ripped off. If you are a woman, I recommend that you do not get too close to the monks so as not to disturb them. Almost everything is handled in cash except for some expensive restaurants or tours, such as diving. In Bangkok you must be careful with your belongings as robberies are the order of the day, like many cosmopolitan cities in the world. I recommend that you stay for a few days in the Rambuttri area to enjoy the area without limitation of schedules, and other days in the central area. 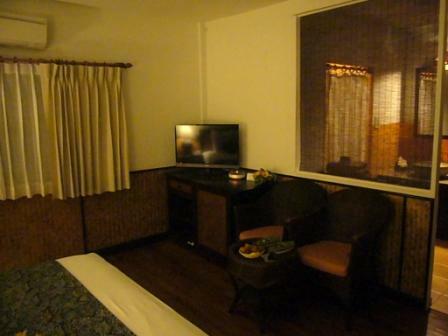 Silom neighborhood is a good place to stay as it is close to one of the main subway stations. If you go as a couple or family, I recommend that you do not stay in the center of town because the price-quality combination is not usually as good as in the more distant areas, even if you have to take a boat to get there. 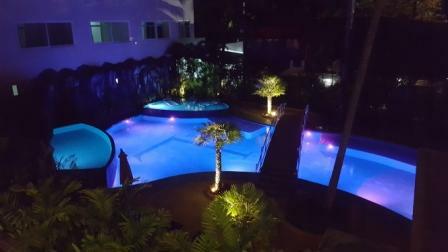 Nawa Sheeva Boutique Hotel is a very well located hotel, the attention is excellent and the quality of the rooms and amenities are also excellent. Super friendly staff willing to help in whatever you need. I remember that we arrived at night very late and wanted to take tour trips the next day, because we were staying just for a few days and they arranged everything we wanted to take advantage of the day. 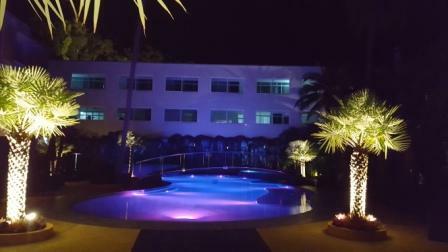 The L Resort Krabi (เดอะแอลรีสอร์ท). 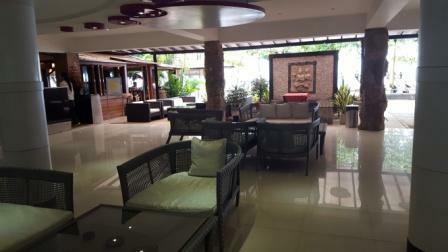 The hotel is very clean and the staff is very friendly and helpful. Bangkok. 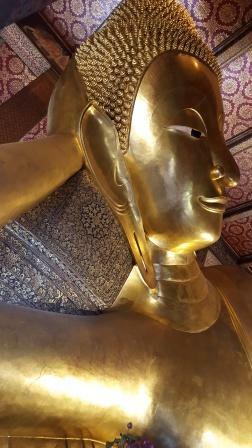 Visit Wat Phra Kaew- Wat Pho – Wat Arun. 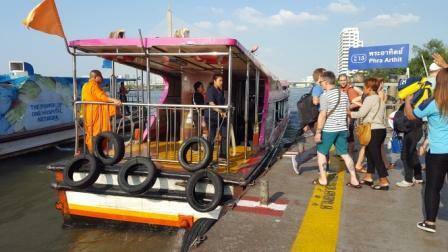 Go by boat through the Chao Phraya river. Walk on Rambuttri at night. Bangkok. Cooking Course (half day). Recorrer por zona céntrica de Bangkok. 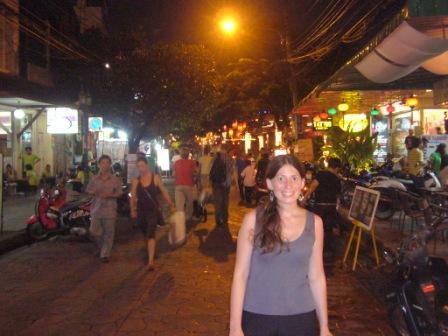 A la noche ir por Silom Road, la zona roja. Al lado hay un night market recomendado de visitar. El barrio en el que se encuentra es Silom. Flight from Bangkok to Phuket or Ao Nang. 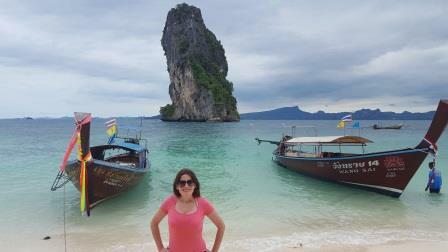 Visit Phuket or Ao Nang Travel to PODA Island. 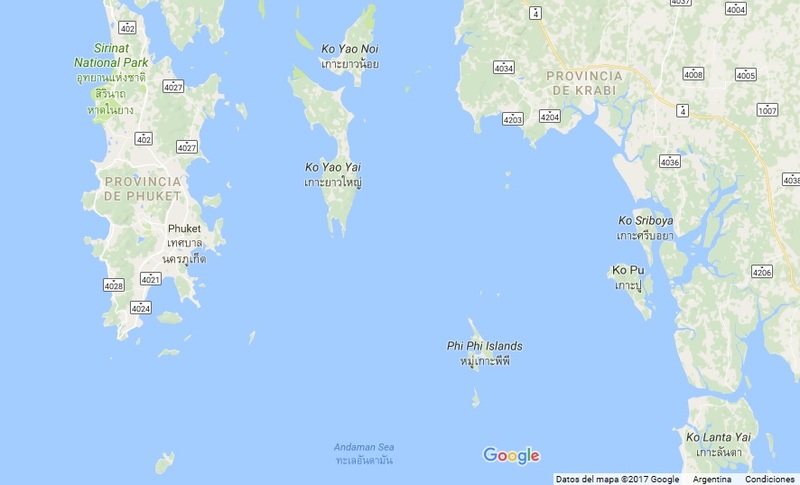 Ferry Ao Nang – Ko Phi Phi or Phuket – Ko Phi Phi. Visit Phi Phi. 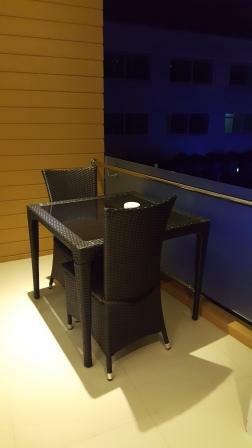 At night visit bars in the town center and have dinner in one of the big variety of restaurants Full day tour to Maya Bay and other beaches such as Monkey Beach Ferry Ko Phi Phi – Ao Nang or Phuket. Flight to Bangkok. Bangkok. 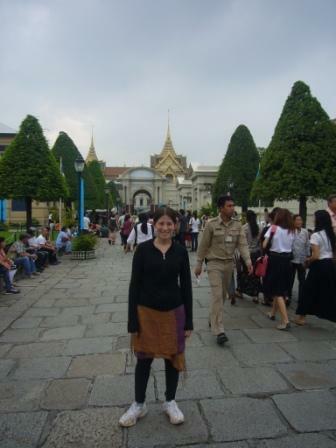 Visit Wat Phra Kaew- Wat Pho – Wat Arun. 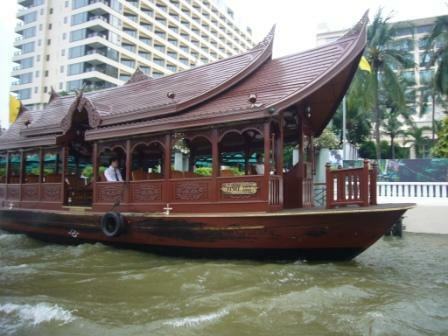 Go by boat through the Chao Phraya river. Walk on Rambuttri at night. Bangkok. Cooking Course (half day). Recorrer por zona céntrica de Bangkok. A la noche ir por Silom Road, la zona roja. Al lado hay un night market recomendado de visitar. El barrio en el que se encuentra es Silom. Half day tour to floating market (goods are really expensive in comparison with other markets in Bangkok). At night go to Silom Road, the red zone. Flight Bangkok – Chiang Mai. Travel to PODA Island. 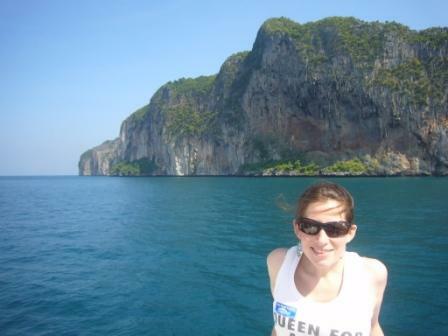 Enjoy the day in Hat Ton Sai and walk on nearby Ferry Ao Nang – Ko Phi Phi or Phuket – Ko Phi Phi. Visit Phi Phi. At night visit bars in the town center and have dinner in one of the big variety of restaurants Rent a kayak and enjoy kayaking. Night Dive tour. 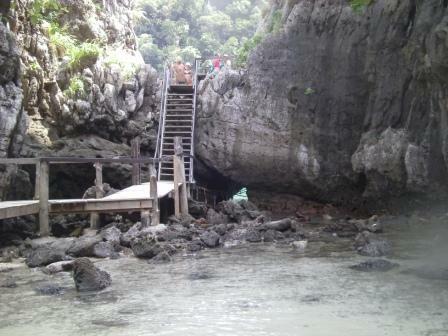 Full day tour to Maya Bay and other beaches such as Monkey Beach Dive or snorkel in one of the beaches. Enjoy the beach. 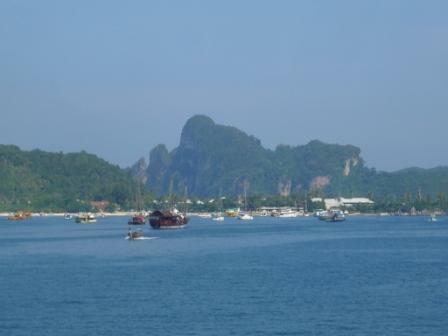 Ferry Ko Phi Phi – Ao Nang or Phuket. Flight to Bangkok. 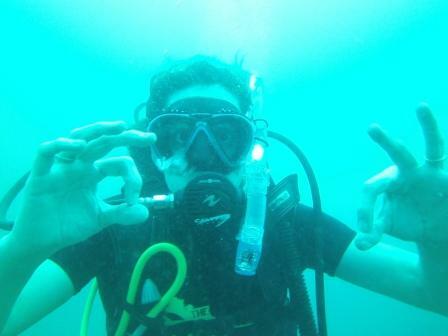 In both itineraries, you can incorporate several days of diving like I did. If you want more information send us an email to info@loloandlali.com. If you want to leave your comments and experiences on the blog, you are more than welcome and we are available to answer any queries.